Say bye-bye to Google Drive for just $13. If you dread the mere thought of rifling through your near-capacity Google Drive to find a specific file among the jumble of random documents, recordings, screenshots, folders, and photos, it's time to make a change. Enter: Dropshare 4 for Mac. What makes Dropshare so unique, though, is that you control its service. As Owen Williams of The Next Web writes: "Dropshare is a great alternative to trusting your files to another company and gives you a lot of control over where they’re stored, while doing away with the limitations on file size that many other apps have." Clearly, this app is in a league of its own. 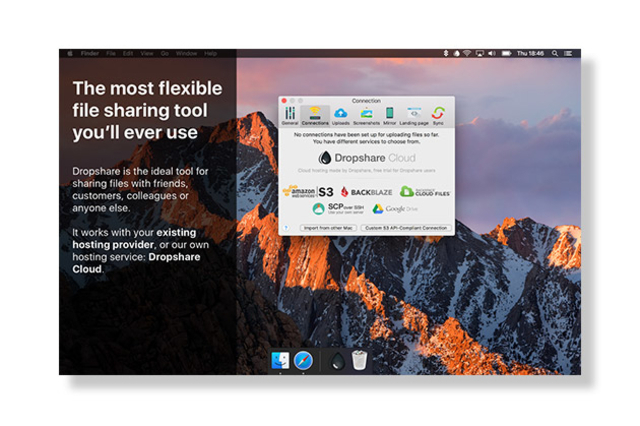 For a limited time, Dropshare 4 for Mac is available through the sfist Shop for only $12.99 — a savings of 48 percent.